Discussion in 'Trek Tech' started by Arpy, Nov 19, 2018. I made it on a list!! Glad you liked my little Preble. It was actually kitbashed fom a bunch of spare parts I had lying around, on a whim. Yeah, I like the way you merged the deflector onto the saucer; canon later did basically just that with the underside of the Akira. The first pic also reminds me of a Martian ship from the War of the Worlds movie for some reason. I like the overall shape of it too. It reminds me of one of the Minosian sentinels from TNG’s “Arsenal of Freedom,” if you push the nacelle forward. I could easily see this in the wreckage of Wolf 359 or on patrol somewhere. Thanks for making it! Actually, I was thinking I should have had the nacelle farther back, to make it sleeker. I may give it another shot some day. Incidentally, I named it the Preble, because a coworker was crew aboard the destroyer USS Preble (DD46) in the 1890s, and he said it was a pile of junk. So when I made a pile of junk into a destroyer, it seemed logical. That rendering of the Sabre class is gorgeous! Arpy and DEWLine like this. Yep. D.M. Phoenix has been a semi-regular contributor to the Ships of the Line calendars over the last decade or so. Gorgeous work there. Tomalak and Arpy like this. I guess I'm imagining it with a smaller nacelle and a larger neck, to give it more of a C-shape. It could work with the nacelle pushed further back, but then I wonder what the silhouette might look like if the lip of the deflector angled the other way. Enterprise-D designer Andrew Probert's Repair Tug is another Galaxy Era curiosity. I think I prefer it upside-down, which its last two decks are. It's also packed with 24th Century Sphinx Class workbees and Probert Shuttlecraft. 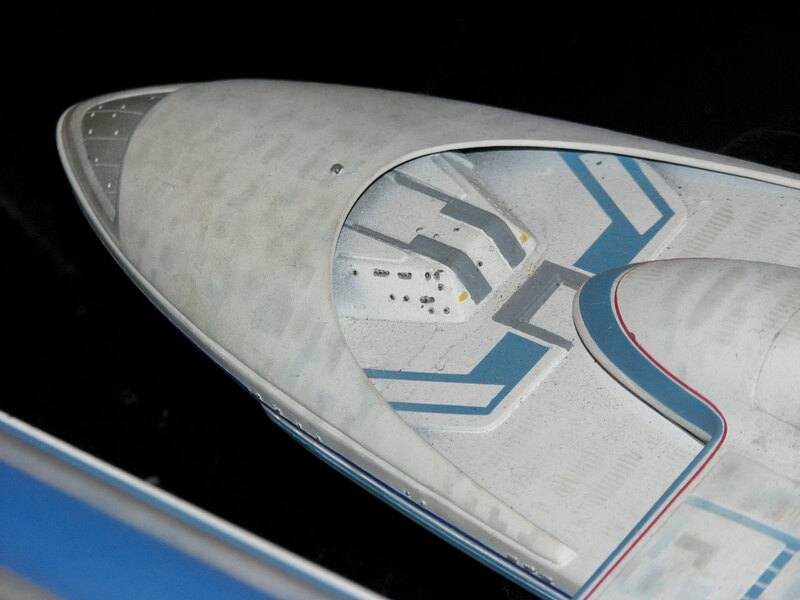 Speaking of repair craft, there's McKinley Station, whose model was reused for Starbase 234. (Don't ask about the "Red White and Blue" bunting hanging in space, because I don't know. Cool arm extensions though.) It wasn't made to be too closely scrutinized, and it's not as organic as much of the tech we're highlighting in this thread, but I enjoy it for the octopus-like drydock it is. Definite points for thinking outside the box, unlike when they use same drydock model for every starship since TMP, which miraculously scales to just fit whatever ship it's housing. I wish they'd mix things up a little. And match tech to its era. I'd like to see those deuterium tankers that D.M. Phoenix came up with for this image get some regular love as well. They may not be starships, but they fill an infrastructure gap the same way that Andrew Probert's salvage ships do. ...I guess the stiff wind that makes the clouds of deuterium vapor billow there falls in the same category as the bunting hanging? Well, there are distinct variants. They just happen to look the same. No, I mean, seriously. The E-B is boxed in a dock that is different from the E-nil one, built all-new for ST:GEN. NX-01 and NX-02 were in different box docks, too. You can't tell at a glance, perhaps, but you can tell at two glances. It's just that a box is a box. What do drydocks actually do? They're not at all ''dry' because they are just in space, where the ship would normally operate. There don't appear to be any robotic construction drones or machinery. What's the purpose of all those flat panels? I guess the floodlights are nice. What do drydocks actually do? They're not at all ''dry' because they are just in space, where the ship would normally operate. No, I mean, seriously. The E-B is boxed in a dock that is different from the E-nil one, built all-new for ST:GEN. It's the same model, only with some of the panels removed to make it look more rectangular than square. It's scaled up to fit the larger Excelsior (as it was on VOY and the calendars to fit Galaxy Class starships and others), though I did appreciate the paint job and added habitable section jutting out from the one side. NX-01 and NX-02 were in different box docks, too. Moving from dry to space dock, there's this concept image of the Enterprise docking to a spacedock -- a spacedock not scaled up from the one seen in TVH. I'm actually glad they did scale up the ones we saw on TNG though, as this does not work for me. 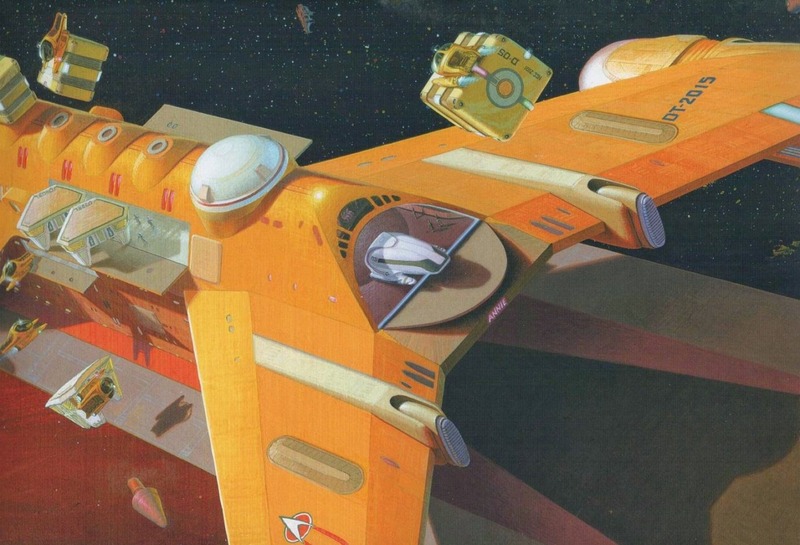 But notice the other concept Probert had for a Galaxy Class locking into a berth made special for it. There seem to be three docking sections, marked "General," "Galaxy," and "Freight." Also, here's a front view of the 'Galaxy-Era Oberth' linked above. (Can everyone see these Pinterest images? I highly recommend joining Pinterest if you can't. It's astounding the number of Trek images I've seen there that I haven't before.) I think it's marked 1701-R, or is that an A? My favorite Captain's Yacht (click to see full size; scroll down to see a gif of it in motion). I think it's so interesting, being this flying saucer we never got to play with, unlike the more conventional shuttle design of the E's. Happy Thanksgiving to all! I'm actually having a mixed American and Nicaraguan one tonight. Should be interesting! The Galaxy/Oberth design is interesting, but doesn't really work for me personally because the proportions are different. On the Oberth series, the saucer is smaller and fits between the nacelles, whereas on this design they're swept back and attach to the rear. It just seems odd proportionally to me, but YMMV. I generally like to think a larger spacedock makes more sense than a smaller one that can "only just" handle a design like the Excelsior or Constitution. I understand why Andrew Probert didn't like the glaring scale error between series, but it seems silly to me that Starfleet wouldn't provide enough room for a ship of the Galaxy's dimensions or larger, given that the mushroom is already a huge structure. I don’t really think of it as being an exact corollary. The saucer is too Galaxy-like to work for that a small ship, so I imagine this to be a little bigger. I’m never really happy when, even for the New Orleans or even Nebula class, they use the same exact saucer/shape for what’s supposed to be a much smaller or less advanced ship. Well the Galaxy-class did take a rather long time to be completed. 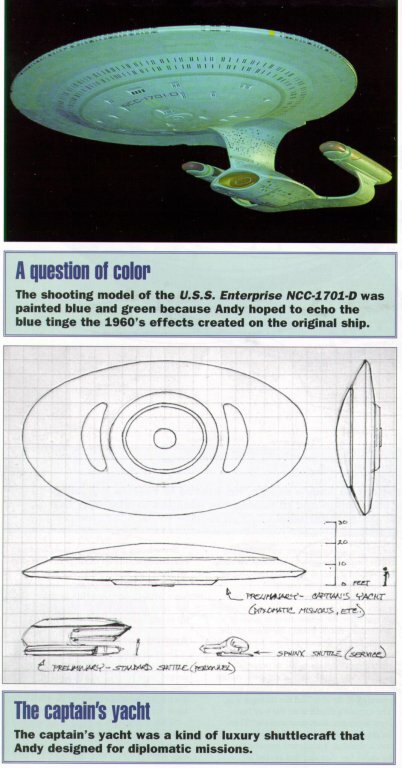 Some parts of the design style were likely finished earlier (like the saucer so they could do testing with it) and thus parts of the design could in be incorporated into other ships being designed at that time, since they Galaxy parts would have been tested already, just connect them to a less powerful warp core and configure the ship accordingly, and you got a new starship that's not quite as good as a Galaxy, but takes elements of it for better performance. That's fair. I'm perhaps the opposite in regards to the Nebula and New Orleans as examples, as I view the Nebula as being a contemporary of the Galaxy and the New Orleans isn't too far behind, at best, on technology. I did find it amusing that the newer volume of the Shipyards book mentions the New Orleans as having three torpedo tubes, which other works have inferred to be the external pods, but doesn't describe them as such and labels the only identified launcher as being on the forward neck similar to the Galaxy. Ships of the Starfleet (a different series than Mastercom's) had a good explanation, in that the launchers were not part of the initial design and were "bolt on" modules added after the war began with the Cardassians in the mid 2350s. 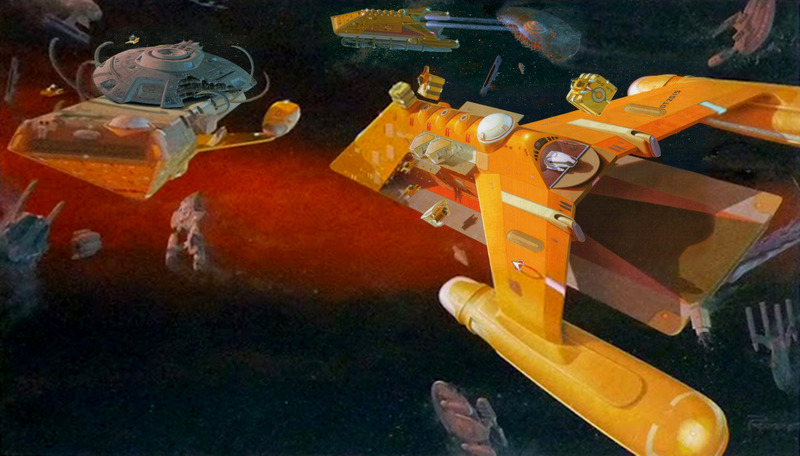 The New Orleans had been designed for an explorer role similar to that used for the Galaxy, and was found lacking in offensive power without them. It’s not so much that the Nebulas aren’t as advanced as the Galaxys, just that they’re “frigates,” right? Frigates are *midsize ships, whereas "cruisers" (Galaxys) are larger. I wonder if it weren’t for the popularity of the maybe purposely kitbashed Franz Joseph ships and the Reliant, which was somewhat kitbashed, there’d be more variation between ships, even from the same era. I was thinking very recently that given all the increasing abundance of different styles of ship from different series and movies, there may become less of an attempt to associate the style of one ship with every other of its “era.” The Discovery is very different from the Shenzhou, even though they’re not that far apart, and both are different from the Enterprise — as are they from the Kelvin, and never mind “The Cage”’s Enterprise. *Similarly, smaller ships should be “corvettes,” as I mentioned in the Jackill Starships Appreciation thread here. I've generally heard them referred to as light cruisers in offscreen works, though I'm not sure if they were ever described as such onscreen or given a type. If not, I'm not entirely sure where the light cruiser term came from but it's been pretty consistent in fan use. The New Orleans class, OTOH, has been inferred to be a frigate after it was identified with the ships in "Conspiracy" which were said to be such in dialogue. For my part, I tend to interpret the frigate designation as mainly being a ship that combines elements of a cruiser and a destroyer. It can often multirole in ways similar to a cruiser, but can also carry heavier arsenal and troops (with potentially better maneuverability than a cruiser) as needed for tactical reasons, and this is partly based on the descriptions of frigates in Jackill and Mastercom's Ships. I imagine weapons much more streamlined than those tacked-on things. The Galaxy can fire ten torpedoes at a time from smaller tubes than those. I think the additions are penetrating sensors of some kind, like mini deflector dishes. They’re used for long-range movement detections or for detailed images of closer subjects...or maybe they’re for disrupting warp fields, like Star Wars interdiction cruisers, or they’re AWAC-like communications modules...I dunno. To me, they’re too boxy and awkward to be torpedo launchers on a ship from the “technology unchained” era that would have worked that out in a more graceful manner.